...and when Malcolm and Seong-Jae come together, someone's going to get burned. 'Criminal Intentions: Where There's Smoke' is a story that should interest you...that is...if you've read the first 5 books. Admittedly you could probably read this book without doing that, but there's a lot of things going on in this series that started before this book and are unresolved and while some of it doesn't come into play here I think from the aspect of some of the relationships anyone reading this without benefit of the previous books isn't going to enjoy or maybe even fully grasp what's going on...so really the gist of it for the best reading experience...'start at the beginning'. 'Where There's Smoke' is every parent's nightmare and because I refuse to spoil any of this book that's all I'm saying...oh, except this nightmare probably isn't quite what your thinking, but if I had to live through something like this as a parent...I would so want Soeng-Jae and Malcolm on the case. I have devoured every episode of this series so far no matter how dark and at times terrifying the stories have been. I'll be the first to admit if it's a Stephen King or Dean Koontz type of thing I'm out of here. But if we're talking Criminal Minds, How to Get Away With Murder, Law and Order any of that stuff I'm there and Criminal Intentions is just that it's a police procedural/crime drama type show (book series) and while each individual story is without fail dark, intense and more than a little compelling. In this book the overlying story arc has started to bleed out into things a little more intensely and I'm loving this because there are questions so many questions coming to light and the only way they're going to be answered is through the progress of the bigger picture and we're all about the progress, right? I wouldn't have thought I could love reading one of these books more than I already do but surprise...I did. This one was so perfect in so many ways. Malcolm and Seong-Jae have been dancing around each other for what seems like forever and honestly I don't know how either of them could stand the heat...because these to men are scorching hot! What these two can do with a kiss should be illegal! Seriously there were parts of this book that needed to be read in the shower...a very, very cold shower!!! So suffice it to say that things have definitely stepped up a notch in the relationship department, but I have no doubt that these two still have a long way to go before they get there and I'm going to savor every last moment of it. While most of this story focused on Seong-Jae and Malcolm and can I just say that was delightful. What I really loved was seeing more of Seong-Jae on a personal level. This case was so much more personal from him than we've seen previously. For me Seong-Jae is a mystery wrapped in an enigma...etc. and I've really been enjoying the little peeks behind his armor that we've been getting until now and I know there's still a lot more to find out about him and I think Mal...there have been hints in previous stories that for me seemed to indicate that Mal like Seong-Jae is so much more than what meets the eye. Gabi is still a presence in Mal's life but I have to say I was happy to see the change in their dynamics...I like Gabi, but for me, Gabi and Mal had there time and they weren't meant to be a forever thing so now it's time for both of them to let go and move on and just like in real live not everyone dies when a violent crime happens and not every relationship ends in a negative manner...sometimes, two people meet and as much as they care for each other there comes a point when they both realize that they're not meant to be forever...they're just meant to touch each other's lives on the journey to their forever. For those who are into the crime/mystery/thriller/whatever you'd like to call it part of the story and that would also be me one the things that have made this series so enjoyable has been the fact that the author has taken the time to create some uniquely different events and not given us cookie cutter scenarios from story to story keeping each episode fresh and interesting. Six books in and this series has not even begun to lose steam. I loved the first book and was more than a little impressed with it as it was also my first time reading this author but at this point I'd say me and this series have gone beyond love and I'm well into a very healthy book addiction where it's concerned. 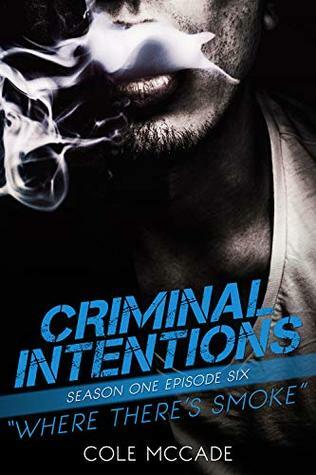 An ARC of 'Criminal Intentions: Where There's Smoke' was graciously provided by the author in exchange for an honest review.